Boston, MA – February 28, 2017 – Manufacturers have a new tool to showcase whole grain products — the 50%+ Whole Grain Stamp. Launched by the Oldways Whole Grains Council in February 2017, the new packaging symbol augments the 100% Stamp and Basic Stamp already in use on more than 11,000 products in 55 countries. Nearly two-thirds of American consumers are making an eﬀort to eat more whole grains, according to the 2016 Food and Health Survey from the International Food Information Council (IFIC). 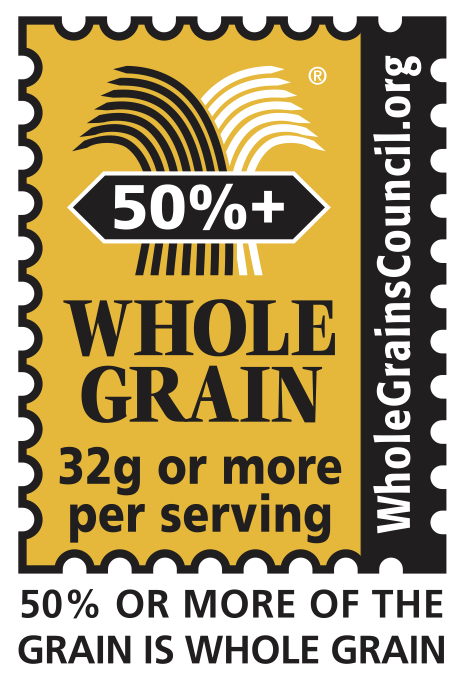 The new 50%+ Whole Grain Stamp makes the search for whole grain foods even easier for shoppers. Consumer research carried out by Oldways in 2015 showed high levels of intuitive understanding of this newest member of the Whole Grain Stamp family. In a census-adjusted survey of 1,500 shoppers, 2 out of 3 consumers immediately understood the message behind the 50%+ Stamp, and its presence also boosted understanding of the Basic and 100% Whole Grain Stamps. 100% Stamp: All grain is whole grain; at least 16g whole grain per serving. 50%+ Stamp: 50% or more of grain is whole grain; at least 8g per serving. Basic Stamp: At least 8g of whole grain per serving. A total of 401 companies currently use the Whole Grain Stamp on their products, and are welcoming the new option. Several companies — including King Arthur Flour, Tyson Foods, Hodgson Mill and Post Consumer Brands — plan to roll out the new symbol as soon as this spring and summer. Additional companies interested in using the Whole Grain Stamp may contact Caroline Sluyter (617-896-4832 or caroline@oldwayspt.org) to learn about procedures and program administration fees.